14 FT. LONG, MEDIEVAL STYLE TRESTLE TABLE. Handmade, entirely from one single ancient oak beam (even the pegs!). 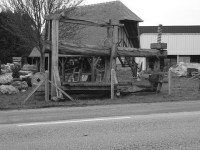 Measuring 20 inches x 20 inches x 18 foot long, the beam was originally part of an apple press, believed to have come from Normandy in France (see below). We deliberately avoided using a mechanical re-saw to cut the beam because, although much quicker and easier, it would have resulted in the planks being too straight and too uniform in thickness. This wonderful 14-seater table has a massive 3 inch thick undulating two plank top, sitting on typically shaped gothic style slab supports, over heavy ovollo moulded feet. The transverse rails are permanently connected to the top by skillfully cut tapered dovetails and the whole top assembly can be detached from the sub-frame by knocking out the top rail pegs. The sub frame is held together with removable wedges and can be fully dismantled. Recent auction sale prices indicate that similar originals sell for around £50,000 to £100,000. The massive beam to make this table came from an apple press similar to the one above. 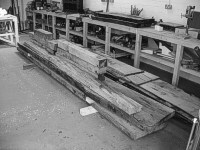 Photo showing the table components all cut from the same oak beam. 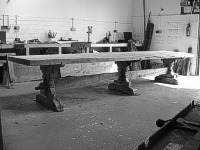 Table completed 'in the white' ready for ageing and final finishing.